Situs inversus totalis (SIT) is a rare congenital condition, occurring with an incidence of 1:8000–1:20,000, in which there is mirror image transposition of both the abdominal and thoracic viscera. The etiology of transposition of viscera is obscured and the condition does not influence normal health or life expectancy; however, it has important surgical implications. 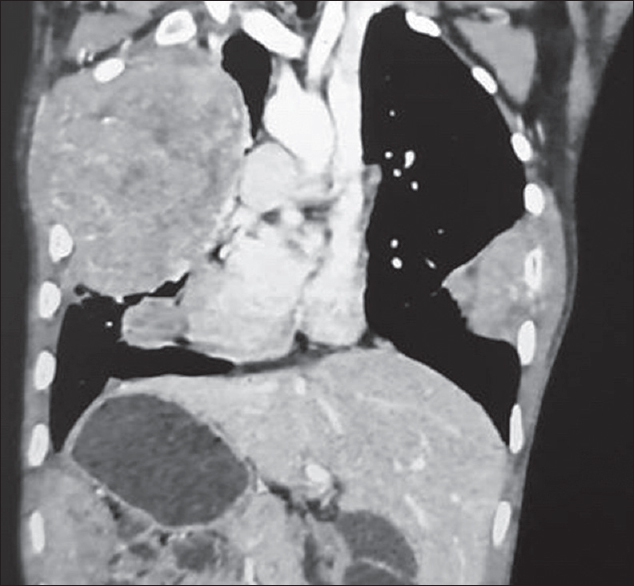 This condition may cause difficulties in the diagnosis and therapeutic management of abdominal pathology., An increased risk of cardiac, splenic, and hepatobiliary malformations are found in patients with SIT. 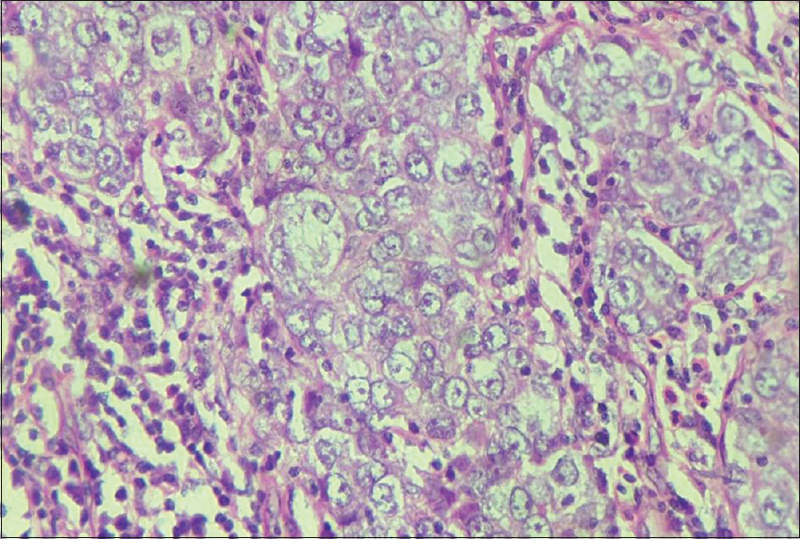 This abnormality is not considered to be a premalignant entity; however, rare malignant neoplasms have been reported. We hereby report three cases, who presented to our institute during the last 3 years, found SIT incidentally. A 35-year-old male photographer by profession complains of dysphasia to semisolids for 1-month duration in August 2013. Careful history revealed that he was on antiretroviral therapy since October 2012. He took antitubercular therapy from December 6, 2012, to September 19, 2013 for pulmonary and abdominal tuberculosis. Investigations were done and his X-ray chest showed dextrocardia. Ultrasound sonography of the abdomen showed that liver and gallbladder (GB) seen on the left hypochondrium and spleen in the right hypochondrium. 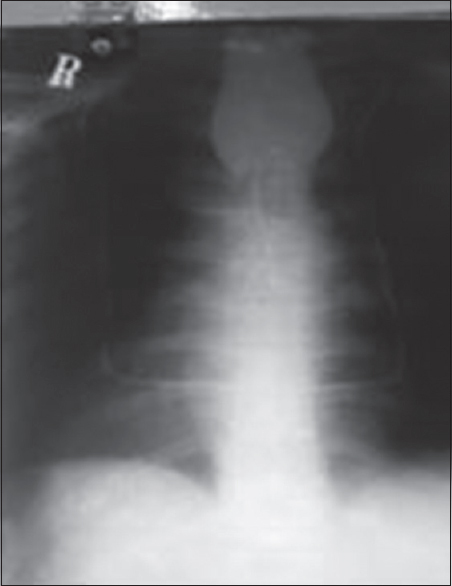 X-ray barium revealed that growth (mass) at middle-third of esophagus with shouldering sign and persistent hold up of contrast with proximal dilatation of esophagus [Figure 1]. Computed tomography (CT) scan of the chest, abdomen, and pelvis showed SIT. Cardiac apex toward the right side with right-sided aortic arch and left-sided superior vena cava. Spleen on the right side, liver, and GB on the left side. There was evidence of 6.6 cm × 4.2 cm × 3.3 cm soft-tissue dense attenuated contrast-enhancing mass lesion involving middle-third of esophagus possibly arising from posterior wall of esophagus with endoluminal component causing proximal dilatation. Gastroesophageal junction was unremarkable. Mediastinal lymph nodes were enlarged. A well-defined subcentimeter size nodule seen in subpleural location in the anterior segment of the left upper lobe suggestive of metastasis. A small lytic lesion with soft-tissue component was also seen in lower part of inferomedial border of the left scapula. Upper gastrointestinal endoscopy was done on August 27, 2013 showed an infiltrative growth was present at 25 cm from incisor tooth. Biopsy was taken and turned out to be moderately differentiated squamous cell carcinoma [Figure 2]. He was treated with radiation therapy to a dose of 30 Gy in 10 fractions from September 10, 2013 to October 24, 2013. His dysphagia got relieved. On follow-up visit on November 15, 2013, he developed jaundice. His CD 4 count was 90. He was lost to follow-up. A 62-year-old female presented with huge thyromegaly of 2 months duration. On examination, asymmetrical enlargement of the left lobe of the thyroid, which was fixed to deeper structure. Multiple lymph nodes were palpable up to 2 cm on the left side of the neck. General physical examination did not reveal any other lymphadenopathy or organomegaly, Waldeyer's ring was found normal. Her X-ray chest showed dextrocardia and ultrasonography (USG) – of the abdomen showed liver and GB on the left side whereas spleen was seen on the right side. The uterus showed multiple fibroids. USG thyroid: right lobe is normal in size and multiple small hypoechoic nodules were seen. The left lobe of thyroid and isthmus were enlarged in size and diffusely hypoechoic in echotexture due to the presence of multiple hypoechoic nodules. 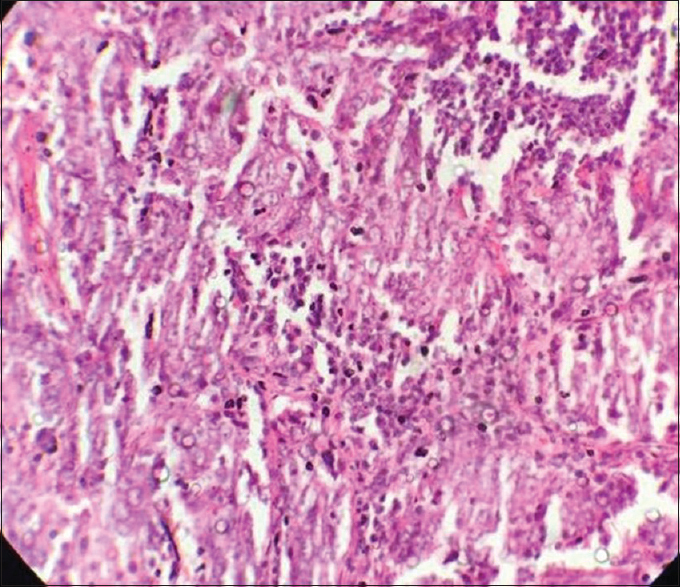 Multiple left-sided cervical lymphadenopathies seen. Great vessels of the neck were normal suggestive of nodular goiter. The two-dimensional echocardiography showed dextrocardia and good left ventricular function. The ejection fraction was 55%. CT scan of the neck revealed that thyroid gland was enlarged predominantly involving left lobe and isthmus with enlarged heterogenous contrast-enhanced mass lesion with area of central necrosis extending into adjacent extra thyroid fat, partially encases trachea which is displaced toward the right side, extending into superior mediastinum [Figure 3]. Multiple lymph nodes were seen on the left side of the neck largest lymph node measuring 2.3 cm × 2.1 cm. 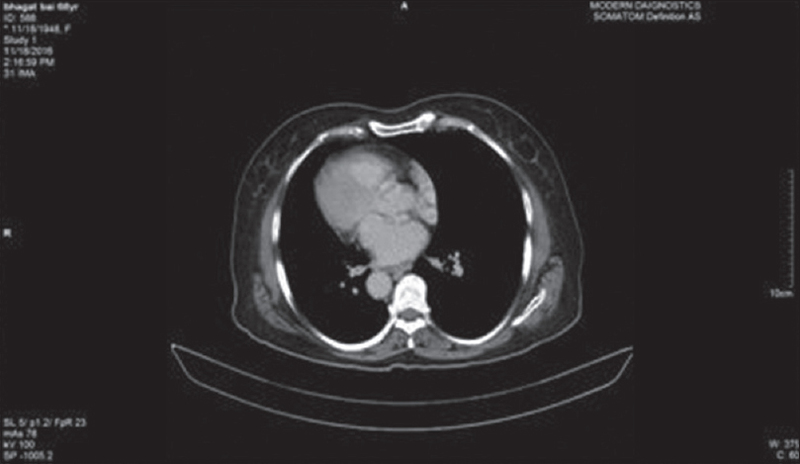 CT scan of the chest revealed dextrocardia [Figure 4]. Bilateral lungs were clear. 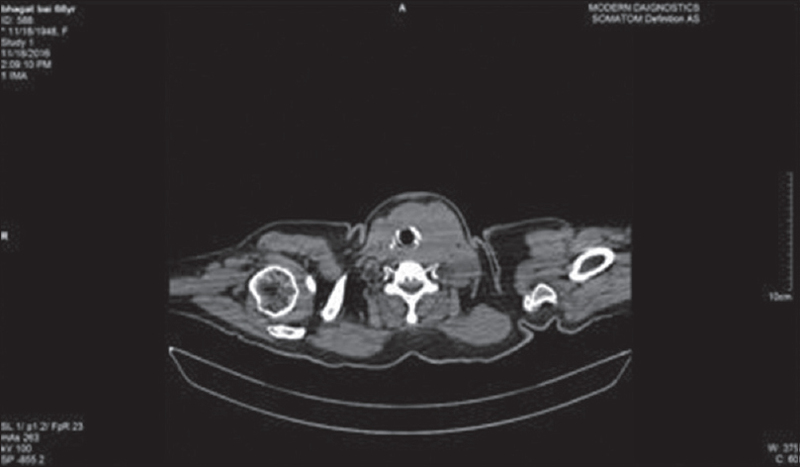 No significant mediastinal lymph node enlargement was seen. No evidence of pleural effusion seen. CT scan abdomen revealed situs inversus [Figure 5]. 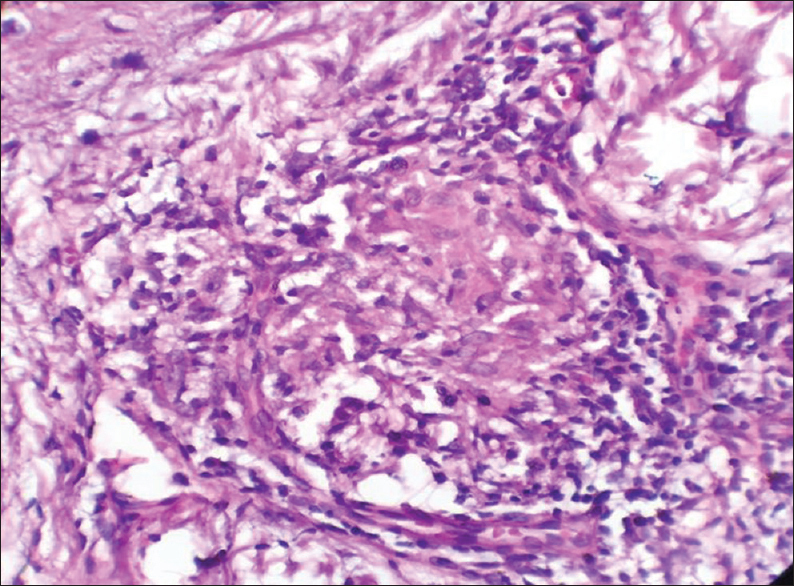 Uterine myomas found calcified; largest one is subserosal 5.4 cm × 5.2 cm. 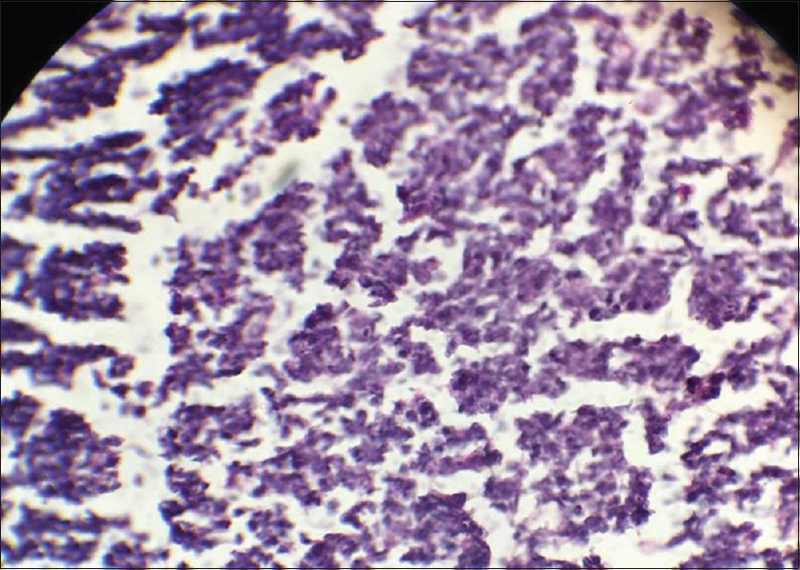 Fine-needle aspiration cytology (FNAC) of thyroid mass and biopsy of the cervical lymph node was suggestive of NHL [Figure 6] and [Figure 7]. She was planned for anticancer chemotherapy cyclophosphamide, doxorubicin, vincristin, & prednisolone regimen (injection cyclophosphamide 750 mg/m2 intravenous (IV), injection doxorubicin 50 mg/m2 IV, injection vincristine 1.4 mg/m2 IV all day one and tablet prednisolone 100 mg per oral in divided doses from day 1 to 5, q 3 weekly). Such six cycles were given, and complete response was achieved. In February 2017, her neck disease reappeared. Radiation therapy (30 Gy in 10 fractions and 16 Gy in 8 fractions) was given to neck from April 28, 2017 to June 9, 2017. A 15-year-old boy presented to my outpatient department with swelling of the right side chest wall anterolaterally in January 2017. His X-ray chest revealed right hemithorax was opaque. USG chest and abdomen showed right pleural effusion, dextrocardia, and evidence of SIT. FNAC of the chest wall lesion turned out to be malignant round-cell tumor. CT scan of the chest was done on January 11, 2017, showed a large contrast enhancing soft-tissue density mass lesion, measuring 12 cm × 10 cm × 14 cm, involving right lung predominantly right upper lobe. The lesion was extending through the right intercostal space involving the right anterolateral chest wall with evidence of destruction of 3rd rib on the right side lateral aspect. No evidence of calcification was seen within the mass lesion. Medially, the lesion is abutting the mediastinum with preservation of intervening fat plane. Right-sided pleural effusion was also seen. Two smaller heterogenous contrast enhancing soft-tissue density lesions were seen in the middle lobe, one along the right anterolateral chest wall 0.9 cm × 2.4 cm and another along right paracardiac region measuring 3.4 cm × 2.7 cm size. In addition, dextrocardia and situs inversus were seen. The left lung appears normal. Anticancer chemotherapy including injection cisplatin 20 mg/m2 IV and injection etoposide 100 mg/m2 IV day 1–5 every 3 weekly, such two cycles were given, the tumor did not regress (March 07, 2017 and May 17, 2017). Palliative radiation therapy was given to chest-bearing tumor area to a dose of 30 Gy in 10 fractions from April 18, 2017 to May 1, 2017. The tumor showed partial response. Therefore, another chemotherapy regimen, including dactinomycin, vincristine, and cyclophosphamide, two cycles given between June 14, 2017 and July 19, 2017. The tumor showed partial response. Seeing unusual therapeutic response to above therapy, a core biopsy and IHC was done, revealed features of squamous cell carcinoma [Figure 8]. He developed anemia and lost to follow-up. After about 10 months, I called him for follow-up. Now, his general condition and nutritional status improved. Follow-up CT scan of the chest and abdomen showed features of SIT with right and no evidence of pleural effusion seen [Figure 9]. He was given injection paclitaxel 175 mg/m2 every 3 weekly. All vertebrates sided pulmonary mass and new lesion in the left lung inferior lingular segment measuring 6.7 × 5.1 cm with associated destruction of 5th rib including humans have anatomical left-right asymmetry during embryogenesis. Normal arrangement is situs solitus and the variations result in heterotaxy, expressed either as randomization (situs ambiguous) or complete reversal (situs inversus) of normal organ position. In SIT, a right/left mirror image transposition of the abdominal and thoracic viscera occurs. In heterotaxy, abdominal viscera may be inverted, whereas the thoracic contents may be normal, or vice versa. In isomerism, the body appears symmetrical with bilateral left or right features. In Japan, the prevalence of SIT is 1:4100 population, which is about two times the incidence reported among Caucasians. Japan has intermediate incidence of hepatocellular carcinoma; however, most of the cases of SIT with HCC were reported from Japan, which may be because of high incidence of SIT there. In SIT, the anomalies of the various organs include bilobed or symmetric liver, absent or multiple spleen, malrotation of gut with abnormal mesentery and reversed pulmonary lobulation. Cardiac defects are common and vascular abnormalities may involve the inferior vena cava, portal vein, and hepatic artery. Although most cases of situs inversus are sporadic, inheritance patterns including X-linked, autosomal recessive and autosomal dominant are found with homologous region in humans located on the long arm of chromosome 12. Yost suggested that left-right axial information is contained in the extracellular matrix early in the development and is independently transmitted to the cardiac and visceral primordial. Recently, a theory model of bulk transport of extracellular morphogens by rotating primary cilia during gastrulation is appealing because it “bootstraps” morphological asymmetry of the embryo from the intrinsic structural (molecular) chirality of motile cilia. About 50% of patients with primary ciliary dyskinesia (Kartagener's syndrome) have situs inversus. The association of SIT and neoplasia is a rare coincidence; only sporadic cases have been reported. The first case was published by Maekawa in 1927; it was an autopsy case of gastric carcinoma in a 43-year-old man with SIT. SIT is not considered a premalignant condition; however, despite its rarity and few published sporadic cases of cancer in this setting, a relationship between situs abnormalities and cancer has been suggested. Some authors postulate that unidentified genes involved in the left right arrangement may have a susceptibility of cancer-like CCDC 11 gene and that mutation or loss expression is involved in some cancers. In addition, it has been suggested that ciliary dysfunction through dysregulation of the hedgehog pathway may be the underlying cause of SIT so Haruki et al. report that patients with SIT may be at high risk of developing cancer due to a congenital deficiency in the function of an intracellular protein, necessary to ciliogenesis, namely the KIF3 complex leading to a ciliary dysfunction with a chronic inflammation which promote carcinogenesis through the proinflammatory nuclear factor kappa B. These hypotheses remain not well elucidated, and further research is needed to assess the genetic association between SIT and malignancy. Many different cancers have been reported (cancer of stomach, colon, pancreas, biliary tract, ampulla of Vater, and kidney). SIT is an uncommon entity that often occurs concomitantly with other abnormalities. The relationship between SIT and cancer is not proven; further, studies are needed to identify precisely genetic and molecular patterns involved in the development of malignancy in these patients. Because of the frequency of associated malformation of transposed organs and vascular and nervous anatomical variations that make surgical management difficult, special attention should be paid to the diagnosis and preoperative staging. Herein, we have described three cases together for the first time in the literature as unusual associations of SIT and malignancies. Written informed consent was obtained from all the patients for publication of this case report and the accompanying images. A copy of the written consent is available for review by the Editor in Chief of this journal. Kamiike W, Itakura T, Tanaka H, Hatanaka N, Nakamuro M, Miyata M, et al. 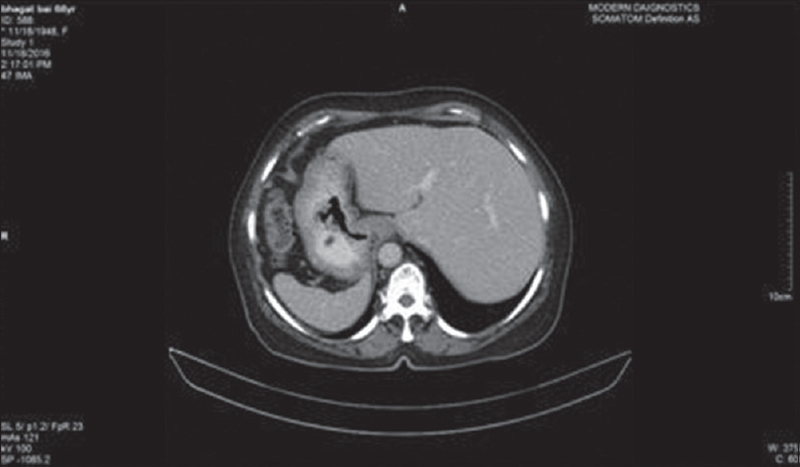 Hepatic segmentectomy on primary liver cancer with situs inversus totalis. HPB Surg 1996;9:169-72. Fonkalsrud EW, Tompkins R, Clatworthy HW Jr., Abdominal manifestations of situs inversus in infants and children. Arch Surg 1966;92:791-5. Katsuhara K, Kawamoto S, Wakabayashi T, Belsky JL. Situs inversus totalis and Kartagener's syndrome in a Japanese population. Chest 1972;61:56-61. Yost HJ. Regulation of vertebrate left-right asymmetries by extracellular matrix. Nature 1992;357:158-61. Levin M. The embryonic origins of left-right asymmetry. Crit Rev Oral Biol Med 2004;15:197-206. Maekawa T. Dextrocardia, report of five autopsy cases, with special reference to hereditary. AichiIgakkaiZasshi 1927;34:481-93. Kim YW, Ryu H, Kim DS, Kim IY. Double primary malignancies associated with colon cancer in patients with situs inversus totalis: Two case reports. World J Surg Oncol 2011;9:109. Wong SY, Reiter JF. The primary cilium at the crossroads of mammalian hedgehog signaling. Curr Top Dev Biol 2008;85:225-60. Haruki T, Maeta Y, Nakamura S, Sawata T, Shimizu T, Kishi K, et al. Advanced cancer with situs inversus totalis associated with KIF3 complex deficiency: Report of two cases. Surg Today 2010;40:162-6.